Proponents of apple cider vinegar for household purposes use it to kill weeds, eliminate gnats and fleas, remove tough stains and clean brass. As a folk remedy, apple cider vinegar can be a treatment for everything from high blood pressure, diabetes and cancer, to warts, bad breath, age spots, constipation and yeast infection. Recent clinical research, however, shows this sour liquid does indeed have healing properties. Talk to your doctor before taking any apple cider vinegar to treat a medical condition. Evidence suggests that vinegar helps control blood sugar levels in people with type 1 and type 2 diabetes. In a 2010 study published in the journal "Diabetes Care," doctors randomly gave 10 type 1 diabetic men a vinegar and water mixture or a placebo before a meal. The researchers found that peak blood glucose levels were 20 percent lower in the men who received vinegar. Another study published in the "European Journal of Clinical Nutrition" in 2010 looked at vinegar's impact on the blood glucose levels. One group of subjects received a high-sugar meal, and another a meal with much less sugar. The researchers found that vinegar lowered peak glucose levels in both groups, but the reduction was more substantial in the group that ate the high-sugar meal. Solid scientific evidence for vinegar's weight-shedding properties is scarce. However, a 2009 study by Japanese researchers published in the journal "Bioscience, Biotechnology, and Biochemistry" found that subjects given apple cider vinegar did lose more weight than those who received a placebo. The scientists discovered that as little as 15 ml of apple cider vinegar daily produced significant reductions in body weight and subcutaneous fat. They theorized that acetic acid, the compound found in all vinegars, slows down fat accumulation. Apple cider vinegar contains many compounds with antioxidant properties, the most potent of which is acetic acid. Antioxidants protect cells from the damaging effects of free radicals that can cause damage to cell DNA. Japanese researchers examined the array of antioxidants in a brand of apple cider vinegar promoted as having a very high nutritional value. In a 2010 study published in “Journal of Agricultural and Food Chemistry,” the researchers found compounds in so-called "High Brix" apple cider vinegar with the antioxidant activity of the enzyme superoxide dismutase. Superoxide free radicals are very toxic to cells, and are linked to many diseases, including cancer. Like superoxide dismutase, the compounds in apple cider vinegar convert superoxide into less harmful oxygen and hydrogen peroxide. Raw, unfiltered apple cider vinegar contains the dietary fiber pectin, which can reduce absorption of dietary cholesterol and cholesterol found in bile. Animal studies have shown that acetic acid can lower low-density lipoprotein, or LDL, and total serum cholesterol. Japanese scientists studied rats fed cholesterol-rich food and also given an acetic acid solution. In this study, published in the "British Journal of Nutrition" in 2006, the scientists carried out post-mortem examinations of the rats given acetic acid, and found a significant reduction in total serum cholesterol in the feces. Drinking apple cider vinegar could lead to conditions such as damaged tooth enamel and irritation in your throat and stomach, says Columbia Health. 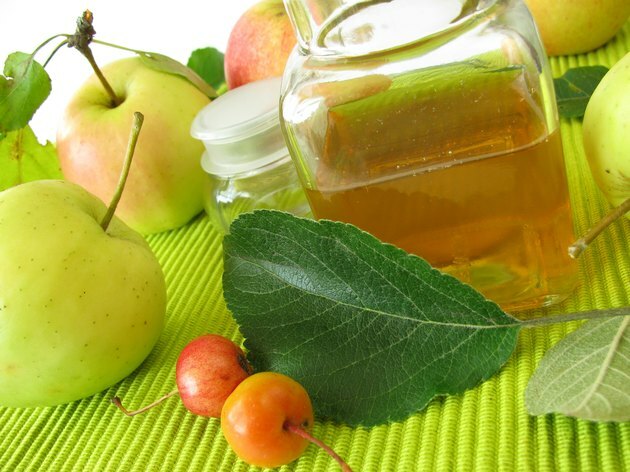 As well, the properties of apple cider vinegar could itneract with medications or health conditions. You should not begin drinking apple cider vinegar without first consulting your health provider. What Can Apple Cider Vinegar Cure?